When I was a kid, maybe 9 or 10 years old, I used to be in this choir at school, and we used to sing at funerals. We used to sing at funerals all the time—once a week or something we’d be singing at a funeral. For some reason, it really had an impact on me. It really, I don’t know, it just sort of put in my mind the idea that life really is short, we do all end up dying, and we’re only passing through this place. We are pilgrims. This is not home. We’re just passing through here. It is easy to forget that. It’s easy to get caught up in life and forget that this, all of this, is temporary, and we’re just passing through here. Some people might say, “Well that’s a bit dark,” or, “That’s a bit grim,” or, “That’s a bit depressing,” or whatever. But I don’t feel that way at all. I think that it is actually very, very healthy for us to spend some time thinking about death from time to time. 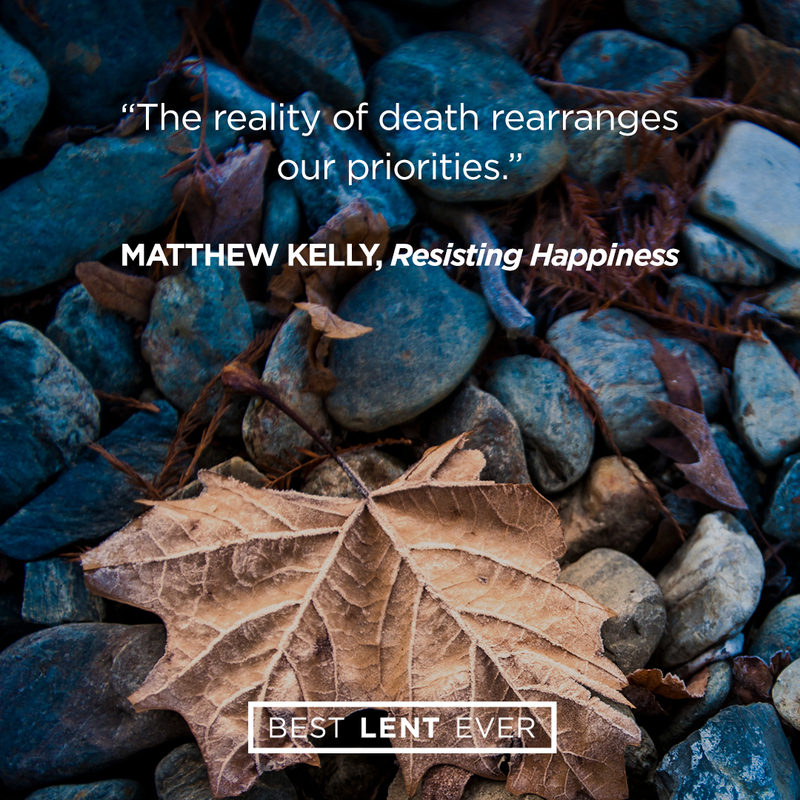 As we make this journey toward Easter, and especially when we go into Holy Week, we will spend some time thinking about death. The Church, in her wisdom, will challenge us to think about death. And there’s another instance of the genius of Catholicism, because when we think about death, we actually live differently. When we come to church, God tries to rearrange our priorities. When you read the Gospels, when you read the life and teachings of Jesus Christ, it is impossible not to have to either accept the Gospel, or reject the Gospel. And in accepting the Gospel, what happens? The Gospel wants to massively overhaul our priorities. When you fall in love, love rearranges our priorities. Thats what loves does. And when you think about death, death rearranges our priorities. If you knew you had three years to live, what would you change on your schedule this year? If you knew you had three years to live, what would you change on your schedule this week? And so from time to time, it’s just really healthy for us to think about death. It is healthy to reflect on the fact that life is short and we are all going to die. If you died today, what would you wish you had done differently? Reflect. God, I can lose perspective from time to time. Help me focus on the things that really matter so I can get busy living! Today’s personal reflection features Dynamic Catholic team member Jack Beers. Jack is our First Communion & First Reconciliation team leader, coming to us from Washington, New Jersey. Jack is a twin, has announced half an inning of a minor league baseball game on the radio, and hopes to one day sleep under the stars in the Grand Canyon. If you died today, what would you wish you had done differently?